installations that have already exceeded expectations at the ongoing Serendipity Arts Festival 2017 (SAF), one installation has left Goans very impressed, especially those from the bustling town of Mapusa. Mapping Mapusa Market is an installation by artist Orijit Sen that originated from a project that the artist has been working on since 2013, involving explorations of the old Mapusa market in North Goa. 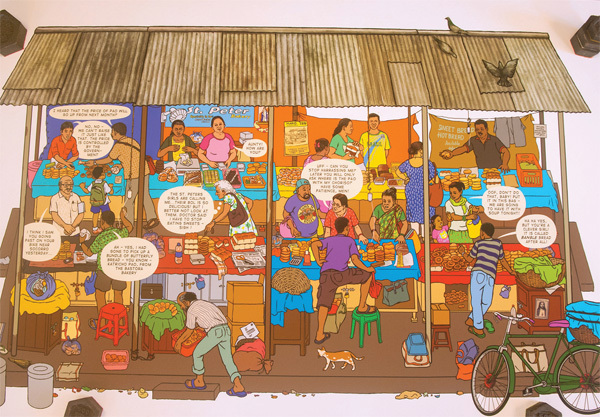 These explorations involve a mix of visual documentation, socio-historical mapping and graphic narration, and delve into the social, cultural and economic functions that the market performs for the people of Goa. The market is like a microcosm of something much larger. As a space that accommodates everything, from locally grown pumpkins and hand-crafted products to imported wines and Chinese electronics, it bears a network of relationships with places close by and far flung, reflecting Goa’s unique history as well as its place in the modern world. Orijit is a graphic artist, cartoonist, National Institute of Design (NID), Ahmedabad alumni and also one of the founders of People Tree, a collaborative studio and store for artists, designers and craftspeople. His pioneering ‘River of Stories’ (Kalpavriksh 1994) is considered to be India’s first graphic novel. “I have always been very much in love with the Mapusa market, and over time, I have explored a lot of its corners, aspects and also discovered many interesting things through the market,” says Oirjit, while speaking about the reason behind choosing this particular place for his project. So when in 2013 Goa University suggested that he teach a course for the students, he decided to do an outdoor project instead, which he called ‘Mapping Mapusa Market’. He started by making a visual map of the flower market, the covered section that was originally built as the fish market. Even though it’s called the flower market and does have people selling flowers, there are also local women selling various traditional Goan items such as coconut jaggery, kokum, vinegar, jackfruit leaf plates, coconut oil, home-grown vegetables and fruits, to name a few. “One of the reasons why I chose Mapusa market and started documenting it is because I somehow developed a liking for the place as a safe-house of Goan culture. The Mapusa market is always under threat. The Mapusa Municipal Council came up with a plan and wanted to demolish the flower market. I took up this project because I wanted to create public awareness that a place like Mapusa market is an important cultural resource in Goa,” states Orijit. “Marketplaces fascinate me. The vendors in the market are the ones that maintain and preserve knowledge about our culture. It therefore stays and is passed down within our community and isn’t lost. Some of the vendors that occupy the space in the market have been doing it for several generations,” he adds. His art installation at the Serendipity Arts Festival is a game based installation which is a visually rich artwork with a lot of details about the market. “It’s like a map that one can walk through. It is laid out horizontally and isn’t up on the walls. One can walk between the alleys and lanes and can see all the things in the market. So I’m hoping it will be exciting and interesting to the people that visit my art installation at the festival,” adds Orijit. When asked to elaborate on the experience of working with students, Orijit reasoned that “the importance of art is about being more central in forming the core of the society we live in rather than staying at the peripheries”. “ And if I can involve students of non-art disciplines into creating art projects, that in itself is a positive result I can be proud about. These students are going to apply all these thoughts and ideas that they have gained while working on this project with me and these ideas will spread into a lot of minds in Goa,” he says.